With it's pratcially experimental visual style, the closer you get to a theatrical experience, the better for this flick, which on video may seem somewhat more generic than it really is. I just can't figure out what I think about "Forces of Nature." The most stylistically creative romantic comedy in recent memory, at times it's downright experimental with, for instance, two computer-enhanced storm scenes in which raindrops fall in slow motion while everything else runs at normal speed. The film has a distinctive look, with bold photography, unblushing close-ups and a potent, tropical color palette. And Sandra Bullock gives the best performance of her career as an droll, carpe diem kind of girl, living life by the seat of her pants as a way of denying her damaged-goods background of hard knocks that she can't seem to shake. Plus, it's funny. 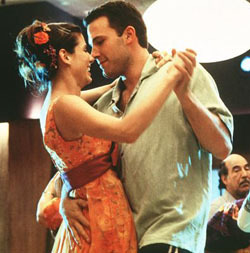 Bullock and co-star Ben Affleck have good comedic rhythm. On the other hand, the core of the story -- a road trip with two strangers who fall in love -- is hardly inventive, and Affleck is a downright dullard until late in the movie when he discovers his inner impetuousness. The catalyst for the mismatched pair's travels is an airline near-disaster. They're seat mates on a plane that has an ugly aborted takeoff, leaving already flight-phobic Affleck resolute about finding another way to get to his wedding to Maura Tierney ("Newsradio") in Savannah, where a hurricane is baring down. He and Bullock -- who had insulted him almost immediately by glancing over his should as he edited his wedding vows on his laptop and saying "Do you work for Hallmark?" -- split the cost of a rental car with a conservative-looking fellow who turns out to be a serious hophead, leading to a traffic stop that lands them in jail. In quick succession they find themselves on a train heading the wrong way, then on a bus full of septuagenarian condo shoppers on their way to Miami. Along the way they manage somehow to lose everything (luggage, wallets, etc.) but their wits, and spend one night horsing around and stocking up in a 24-hour Kmart. Not bad so far, but for the first three reels, this perpetual motion story has little energy, despite insistently sprightly camera work and soundtrack, and it's riddled with unoriginal ingredients, including the bride's disapproving parents and a successful (but dopey) ex to tempt Tierney. Throughout the trip, the argumentative couple build sexual tension, and Affleck begins having doubts about his pending nuptials. It doesn't help that he finds himself accosted by a string of strangers with bad marriages offering unsolicited advice. It doesn't help the movie that the plot is often predicated on silly misunderstandings, ill-advised lies and bad decisions that make it hard to empathize with the characters at times. But throughout the picture, director Bronwen Hughes ("Harriet the Spy") sustains an atmosphere of creativity with her startling style. Then in the last act, "Forces of Nature" redeems itself almost completely by turning most of these cliches on their ears one by one, leading into something of a surprise ending. I don't know if that forgives the use of such cliches, especially when the story isn't enough to distract one from asking questions like "Why don't they take the Interstate?" and "Why hasn't this weather-whipped wedding been moved indoors?" But even with such questions, and even though Affleck isn't exactly a ball of fire, he and Bullock manage to maintain a reluctant romantic combustibility between them that keeps the movie alive until it really cuts loose in the last 30 minutes. Bullock is this movie's saving grace. She portrays complexities that are rare in romantic comedy -- a disastrous marriage, guilt over abandoning a child some years before -- yet she gives "Forces of Nature" its odd, whimsical vivre. I wouldn't say it's worth seeing just for her, but after re-reading what I've written so far, I do think it's worth seeing, if only because its so refreshingly unusual in its mood and manner.